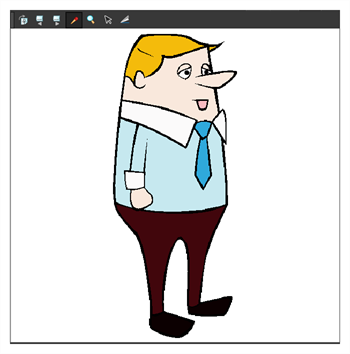 Once you have a fully painted drawing, you can use it as a colour model and load it in the Model view. That drawing can be used and loaded in any of your Harmony scenes—see Painting Drawings. Once a drawing is loaded in the Model view, you can use the Model view Dropper to select a colour from the model and use it to paint in your Camera or Drawing view without having to pick the colour from the colour palette. You can do more than just copy colours from a colour model. Harmony gives you the ability to copy parts of the character directly from its colour model and paste these elements into the Drawing or Camera views.